It may seem strange to include Buddhism under the heading of Pagan but there is a contention that as Buddhists do not worship one of the recognised ‘traditional’ gods, indeed they do not worship a god, and is also very earth linked that it should be classed as Pagan. 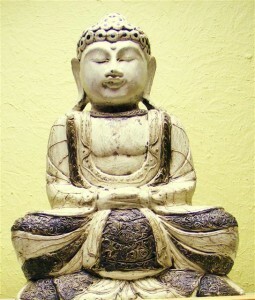 Buddhism began around 500BC with the birth of Siddhartha Gotama, the Buddha, who reached enlightenment at the age of 35. Buddhism is the path of practice and spiritual development ultimately leading to a state of Buddhahood or total enlightenment. The name comes from the word ‘budhi’ that means ‘to awaken’. Through such practises as meditation self-awareness is acquired and the development of kindness, wisdom and awareness. The basic principles are simple and teach such things as the awareness of every action having a consequence and that nothing is permanent there can always be change. These principles have the ability to be applied irrespective of race or creed and in many ways. Whilst there are many different styles of Buddhism there is a common set of principles of lack of dogma, non-violence, tolerance of differences and generally some form of meditation. There are more than 350 million Buddhists in the world and the number is increasing particularly in the West. Much of the belief structure of what is often called New Age beliefs align with Buddhism. From this you can see that the increase in popularity in the West comes from the answers that Buddhism can provide to a materialistic world. It is also a way of life that empowers the individual but in a state of humility. Although you will see many statues of Buddha in monasteries, Buddha is not worshipped or even petitioned. The statues usually of a seated Buddha with a serene look on his face reminds the onlooker of the state to which he/she aspires. Tolerance of other religions and viewpoints is central to Buddhism and there has never been a war fought in the name of Buddhism nor do Buddhists preach or seek to convert only answering questions when asked. They seek the greater understanding of all things and all views. The Dalai Lama has been a great power sending peace and joy throughout the world and doing all he can to instil peace and tolerance where is it missing.